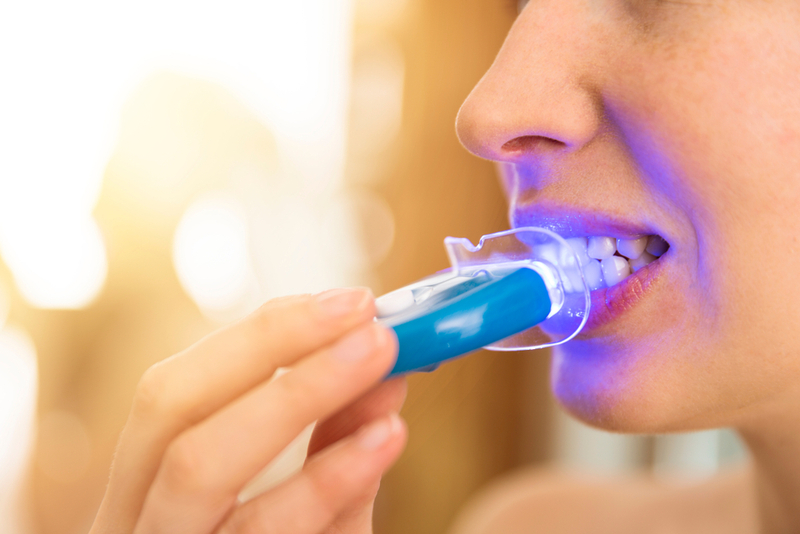 Teeth Whitening: Are These 6 Methods Safe? It’s no secret that the process of teeth whitening is a common procedure. Most people want sparkly white smiles for that extra boost of confidence. And nowadays, with the multitude of teeth whitening options available mostly over-the-counter, it can seem like you’re spoiled for choice. However, there are risks you should know about that come with these teeth whitening methods. Today, we’re running through six common teeth whitening techniques and how they might affect your teeth and gums in the long run. Toothpaste brands are particularly quick to slap the ‘whitening’ label on their products, but they actually don’t whiten your teeth – at least not properly. In reality, ‘whitening toothpaste’ just removes surface stains from your teeth, rather than properly whitening your teeth like a dental procedure would. Whitening toothpastes remove stains because they are more abrasive than other kinds of toothpaste (but they do not contain hydrogen peroxide, which is good news for gums). Generally, whitening toothpaste can cause your teeth to be sensitive. If used too vigorously, they can cause gum recession, however, this is also to do with your brushing technique. Therefore, teeth whitening toothpaste is only suitable for surface-deep whitening. Generally, custom-made whitening trays do work to improve the whiteness of your teeth. They work because they are fitted to your mouth, reaching all the edges and ridges of your teeth. The hydrogen peroxide gel in the trays sits on all these areas of the teeth and if applied correctly, shows results without harming gums. The results may show just a week after treatment. Are they safe for my teeth? While whitening mouthwash does contain the ingredients that whiten your teeth, unfortunately, thirty seconds of rinsing is not enough to display results. Mouthwash that claims to whiten your smile is safe for your actual teeth, but it presents risks to the rest of your mouth. Chemicals that whiten your teeth are not meant to come into contact with the soft, sensitive tissue that makes up the inside of your mouth. Using a whitening mouthwash can therefore expose these areas to harm. Many people do see results from teeth whitening strips, and this is because their main active ingredient is carbamide peroxide (which contains hydrogen peroxide) in the gel. The gel is what coats each thin strip of plastic. Because they are not custom-made, whitening strips often do a poor job of whitening the edges of your teeth and are more effective on flat surfaces. If you have a cavity and the whitening chemicals from the strips manage to get to it, the strips can cause intense pain. Therefore, you should get a dental checkup before you plan to use the strips to ensure you do not have cavities. Unlike custom-made trays, teeth-whitening strips are one-size-fits-all. Only, they often don’t fit everyone, meaning the chemical strips can come into contact with gum or soft tissue and damage those areas. Technically, those DIY lemon pastes (and similar ‘hacks’) do work. But they work because they’re acidic and they wear away your top enamel, which is dangerous for your dental health. DIY whitening is not safe for your teeth. Acidity causes your teeth to age faster and look more worn out, and worn enamel can cause severe pain and sensitivity. Dentists are able to use a higher concentration of hydrogen peroxide than what is present in over-the-counter products. Therefore, results are often shown faster if the patient opts for cosmetic dentistry. Professional teeth whitening at your dentist works because your teeth are initially painted with the hydrogen peroxide gel. The gel is then activated using a laser or UV light. The strength of the gel combined with the laser or UV light often shows instant results. Getting your teeth whitened at the dentist is a generally safe procedure, however it is best to address any concerns with your dentist before jumping into it. Teeth whitening procedures fall under the broader umbrella of cosmetic dentistry. As a clinic offering cosmetic dentistry in Berwick, Eden Rise Dental is dedicated to helping you achieve the perfect smile. If you’d like to find out more about cosmetic dentistry in Berwick or teeth whitening in particular, don’t hesitate to give us a call on (03) 9702 6111.